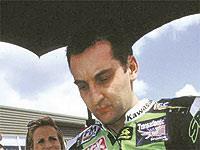 Michael Rutter says he won’t be able to ride in the TT because of the Snetterton BSB, TT clash.
" I don’t know who, but there is someone in the wrong, " he said. Rutter won’t be able to ride because his team is unable to have bikes in both places, but the alternative of riding as a sidecar passenger doesn’t tempt him, " I'd rather ride round with no clothes and no helmet round the Isle of Man that go round as a passenger "
To read the full transcript from his live webchat, simply click on the link on the right of the page entitled " Michael Rutter: In his own words " .